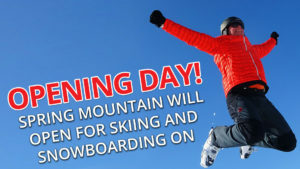 OPENING DAY for the 2018/19 ski season will be this Thursday, December 13th!! Doors will open 3:30 PM and lifts will run 4PM – 9PM. We will be charging Student Night Rates for EVERYONE! $20 Lift Tickets and $10 Rentals. We will also have walk-in group lessons for $20 at 4:30 & 6:00 PM. Plan to arrive at least 45 minutes before the lesson you want to take. Private lessons are available to book online!